This table can be used to track class performance when you fill in data about the number of students demonstrating mastery or you can use this sheet to track performance of individual students. 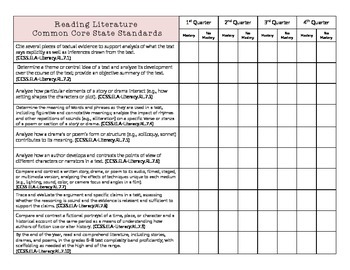 There are FREE versions of this chart for the CCSS reading literature standards for grades 6 and 8 as well. You can also track your student's mastery of the Common Core Information Text standards with this free digital download. It is also available for grades 6 and 8!